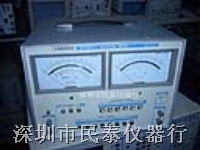 The meter can speedily measure 400 Hz/1KHz distortion (0.01%) and 20Hz to 100KHZ level with push button operation. As an automatic distortion meter, this model is ideal for adjustments and inspections on the mass production lines of radio, tape recorders and other audio products. The distortion and level are indicated simultaneously on two meters. The fundamental frequency rejection circuit for the distortion measurement employs a filter with a wide rejection range to enable the accurate measurement of the distortion even with signals containing wow/flutter such as those supplied from tape recorders, record players and other equipment. 0.0 1 % to 30%. > -70dB at fo ± 10%.